Tour participants boarded a charter bus (kindly provided by Missouri River Energy Services!) 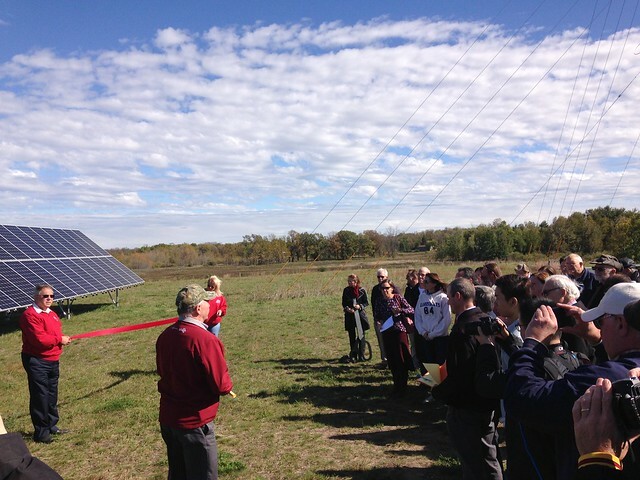 and set off to see the Ribbon Cutting of Detroit Lakes Public Utilities’ Community Solar installation. Red ribbon and scissors in hand, folks from the Chamber of Commerce, local officials, Detroit Lakes Public Utilities Commission, Senator Kent Eken, and Josh Mason of Detroit Lakes Public Utilities cut the ribbon and made an official welcome. Great light, less energy: After a group photo was taken, folks got back on the bus and continued over to Detroit Lakes Public Utilities Electric Department where Roger Moltzan spoke to the group about the warehouse’s commercial LED lighting. Eating up grocery efficiency projects: The tour then continued to Central Market, a 24 hour grocery store, where Director of Maintenance Chris Oswald showed everyone the market’s energy efficient refrigeration, energy efficient coolers, and commercial LED lighting upgrades. “These energy efficiency upgrades help keep grocery store prices down,” said Chris Oswald who has a Building Operator Certification (BOC). “The old metal halides were too intense. The light of the color shifted over time. The LEDs are more consistent in their color rendering which makes for a better presentation of the products. The energy efficient coolers make the store more comfortable and less chilly, which our elderly customers have really appreciated. The new coolers are more convenient to use too, so folks don’t need to reach all the way into the cooler anymore.” The Central Market used utility rebates both on refrigeration and LED lighting. Restaurant energy savings, Seed Grants, and good conversation: The tour ended at restaurant Hub 41, where Amy Collins of Missouri River Energy Services explained how Hub 41 was able to use utility rebates to purchase Energy Star rated food equipment. CERTs Co-Director Lissa Pawlisch shared information about CERTs Seed Grants. Participants enjoyed tasty food and beverages on the patio overlook and inside Hub 41 while networking about clean energy projects. This beautiful sunny day was a perfect time to learn about solar and take a clean energy tour! We hope next time you’ll be able to join CERTs to showcase clean energy projects in your hometown!